Finish off your signature burger or fried fish sandwich with this Choice 24 oz. clear wide mouth squeeze bottle. This bottle's versatile, simple design is ideal for both back-of-house and front-of-house applications. While its open tip eliminates the need to cut off the top, its tight, no-leak cap prevents accidental spills and messes. Thanks to its innovative, wide mouth design, it's also easy to refill and clean after busy shifts at your restaurant, cafe, concession stand, or cafeteria. These clear bottles are great for condiments, when you're having an affair that just doesn't look right with re and yellow containers. Heavy duty plastic, easy screw on lids, good size opening for filling and nice spout hole for pouring contents. The 24oz clear wide mouth squeeze bottles are perfect for your sauces that you use a lot of. The wide mouth allows for thicker sauces to come out more easily. Overall, a good product. Only complaint is they tend to wear out after a few months of daily use. You have to be very careful because the lids will begin to fall off during regular use. For the price, it is still a better product than I have bought at other places. Great quality squeeze bottle with a nice tip. So far they have lasted a really long time. I have not had to replace one yet. Great bottles that get the job done. They are easy to clean, refill, and reuse also. Can withstand the dishwasher as well. Great product to use. The condiment bottles are great for storing different sauces. Easily visible for the cooks and cleans well. The price is amazing. Also can store extra condiments for your busy times. The wide mouth feature makes refilling so much easier. It also makes the product easier to wash. Very durable and a great value. Can't recommend this product enough! This squeeze bottle is amazing. It holds lots of liquid and cleans great, the lid stays on tight so there are never any spills. Highly recommend. I love the is product so much! We have about 24 of them and we use for about everything! Its great when you're in a hurry. You should look into the larger options as well! Good quality squeeze bottle that we use for oil and water on our griddle for stir frys of vegetables or meat. Holds a good amount of liquid. Great low price for a product that we go through alot. We use these for all of our sauces and we have some that sit close to the grill and every once in a while they get burnt. These bottles are easy to work with as you would expect. The price is right and I would suggest also buying a bottle brush to clean quickly and easily. Not a fan of squeeze bottles. They get stained and the tops are hard to clean. We go through a lot of them. and throw them away. These pour bottles do a good job. They are sturdy and squeeze well. It is even possible to cut a bit of the tip off to make them pour faster if you use them for a thick viscous liquid like mayonnaise. We bought two style squeeze bottles with a different mouth piece. The Choice 24 oz clear wide mouth squeeze bottle was very easy to work with. We had little difficulty squeezing our condiments from the bottle and on to our sammies. They controlled their liquid very well and is a recommend buy for anyone who plan to do a ton of squeezing. We use these ALL over the kitchen. However, pay attention to the pack size. I thought I ordered 12 bottles and somehow ended up with 48... We will use them so not that big of a deal. just a bit of a surprise. The Choice 24 oz Clear Wide Mouth Squeeze Bottle is amazing! I was easily able to fill the bottle and my favorite feature is that I was able to trim the tip for different products depending on their thickness and texture. We've run them through the dishwasher numerous times and they still look brand new. I use clear wide mouth squeeze bottles for chocolate sauce and caramel sauce at my coffee shop. The bottles are easy to clean. I would recommend this product. Great quality squeeze bottle, and a good overall size. Top screw on securely and the wide mouth makes filling easy, especially with more viscous items. These squeeze bottles are excellent for precision garnishes and cooking oils. They are easily filled through the wide mouth with dressings, oils, and liquids. We use many in our kitchen and they maintain their integrity with constant usage. Day labels stick nicely to the outside for easy labeling. These large squeeze bottles worked perfectly for Salad Dressing at a recent Wedding Salad Bar. They were sturdy, easy to fill with the wide mouth, clear enough to see the contents inside and easy to clean. These are perfect! They clean easily, hold up well in a dishwasher and provide a ton of options for use from ganache to sauces to oils and vinegars. This is a GREAT size! Not too small and not too big. We put marshmallow creme in these because fo the wide-mouth/easy flow. Going to try these with peanut butter sauce topping! As soon as these arrived we said we should probably order 6 more. They are the perfect size for our sauces and they are easy to hold and use. The pour spout and hole in the top are also exactly what we wanted. These bottles are a good product. They are easy to handle and holds plenty of dressing for our sub shop. Product is as described, we are satisfied with these. Very happy. Great quality product! It has held up well so far with medium to light use! Will order more in the future for sure! These bottles are solid choice! For the value, the quality, and the countless uses, you cannot go wrong. They are easy to wash, and stain resistant! These squeeze bottles are perfect for condiments. The wide mouth makes it easy to pour. It is durable and easy for clean up. I would definitely recommend! Wide mouth makes it super easy to fill, dishwasher safe is always a win in my book. We're using these for snow cone syrup at a party. Fantastic!! Works Perfect for all dressings, sauces, the sixe is perfect to work with on a kitchen you can use it with oil, i love the way it works!!! Upon making over five gallons of house BBQ sauce I knew I needed something large enough to contain the bulk of it. I’ve typically used the 32 ounce option but I wanted to try something a little slimmer for folks with smaller hands. These squeeze bottles have been an ideal solution for some of private labeled items. These are perfect for oils and dressings. Economical and best value for the money. And as always, webstaurant has the fastest shipping. Will be using these for a long while, and will be ordering more. These bottles are easy to use and affordable, these wide mouth makes it easy to refill sauces without pouring all over the counter. Works like wonder! These are great bottles. They are terrific for dressings, oils and liquid butters. Easy to clean and they are heavy duty. I am very happy with this purchase. I use this for all my boba syrup. I love how it look and it's just so easy to use. love it and would always buy again. We love these wide mouth squeeze bottles. You will lose the lids before the bottle needs to be replaced. They are pretty easy to clean and a great price! Squeeze bottles definitely get abused in the kitchen and these bottles are holding up well to that abuse. I like the 24oz size it works well for items like bbq sauce that we go through a lot of and the wide mouth bottle makes filling easy. In general I like the bottles. They are sturdy, reasonably priced, and function well. They default to dispensing a small thin line, but it is easy to modify if desired. I do wish that they came with caps, however. Tops can clog kind of easily, but are very easy to clean out. They also warp if exposed to heat, so that is something to keep in mind. Overall good. This larger bottle is great - lasts a full day for our sauces and mayo, the wide mouth is perfect for thicker sauces. Can't beat the price! Great price for squeeze bottles, these are a pretty generic bottle. We use these for sauces and spices, the bottles have a large opening for easy filling. We go through a lot of sauce bottles in our restaurant. They are great for holding salad dressings, aioli and other sauces. They hold up fairly well. I have all sorts of different sizes of squeeze bottles for different tasks in the kitchen so it's important that they hold up decently. this squeezie works great for sauces or travel bottles of soap and the wide opening makes refilling really quick and easy. These squeeze bottles were a little on the bigger side than what I expected but they got the job done just as good! Nice pin point for precise garnishing for me so I definitely will buy the same brand just in a smaller size! Oh and they don't melt in a hot hot dish washer! I used a six pack for A1 and another for BBQ sauce. This allows me to ha s less waste each event. I on.y do a few events in the summer that I use A1 and BBQ sauce for but this makes it all easier. Great product at a great price, I would pay a lot more from my normal supplier. It came just as shown. I would recommend this item for anyone that does a lot of cooking. We use these for juices at the bar and salad dressings in the kitchen. Easy to clean, takes up little space, and helps make sure product is rotated properly. Bottles are great for our glazes. We use them for all sorts of flavored glaze. Wide mouth is perfect when you want easier access to load and also to clean. Awesome buy on these Clear Wide Mouth Squeeze Bottles! Purchased from Webstaurant Store at a fraction of the cost from my national food provider. Great deals here! I love having these! It makes condiments so much easier to dispense - no more scooping out mayonnaise, or putting up with bottles that have too wide of mouths or openings. It also helps keep everything uniform in my fridge. I don't have to try and accommodate weirdly sized bottles. We LOVE these squeeze bottles. We purchased some for work and I gave some to my mom who has arthritis in her hands, it was hard for her to lift the olive oil bottle. Now with these bottles, we filled them up and she can squeeze them with no problems! No spillage or leakage. The only issue that I have is I wish we had the option of buy caps for them. We were able to use something else to cover them, but still…..
For efficency we are utilizing all of these for our mayos and dressings they will help with portion control along with ease of space in the cooler. The 24 oz clear wide mouth squeeze bottles are used in our establishment daily and you can't beat this price. We use them with ketchup, dressings, mayo, mustard...basically any kind of condiment. They are easy to squeeze and customers like being able to put their own toppings on their food. The wide mouth allows for easy refills and cleaning. These work great for mayo, barbeque sauce, etc in our small deli. Easy to fill and hold up well. Holds a large amount so we're not constantly filling. These are the big bottles. Will see how they handle the cold in the fridge. The volume on a busy day. Have not had to clean yet so not sure how easy that will be. Stay tuned. The light weight plastic makes it easy to squeeze. Its clear so you can view the contents. The wide mouth allows for an easy flow and its easy to clean. Love how big these bottle are. Have bought them before for work liked them so much buying them for daughters outdoor wedding. Will be perfect for holding sauces. plus being so big not fearing will have to be refilling during reception. We use these big bottles for simple syrup since we go through so much of it. The flow is easily controllable and the caps are nice and tight. this product is very easy to used, i currently use it as a syrup dispenser. So easy to clean as well, i would totally buy it again. These squeeze bottles are a great asset in my kitchen! They hold a good amount of any product that needs to be close at hand. The nozzle can be trimmed to allow dispensing of thicker sauces and purees. This Clear Wide Mouth Squeeze Bottle 24oz is a perfect solution for any use, the bottle is clear and the queeze is without cone. You can also write in the bottle. Excellent squeeze bottles at a great price! Overall, we're very happy with the Tablecraft bottles. My only criticism is that they only work with other Tablecraft caps. We've acquired a lot of bottles over the years, and while the Tablecraft caps fit other bottles, other brands of caps do not fit on the Tablecraft bottles. These bottles work well for our deli. We fill them with mayo, or any other condiment, and use them everyday. They are so far holding up to the daily use. Easier to fill than the small opening bottles. The wide mouth on these containers are great. They allow for easy filling and cleaning. This size was great for BBQ sauces, ketchup, and olive oil. We have used smaller bottles before, but were filling them up too often. Small tip- if you have a thick sauce you may need to cut the dispenser top at an angle to prevent backups. These squeeze bottles are a life saver. I can fill all 6 and they will last most if not all day on a busy day of serving BBQ. Durable construction, holds up to cold or hot sauces placed in it. Dish washer doesn't seen to bother it, even ordered a few extra to keep on hand! These are fine to go in the dishwasher and for heavy use. Solid seal with the lid. We cut the tips on the lids off to make them easier to squeeze for higher viscosity liquids, and they work great. Wish they came with caps though. These squeeze bottles are perfect for my everyday use. I use them for oils, cooking wines and sauces as well. They come in very handy and are the perfect size. I will definitely be purchasing more of them. Perfect size for on the counter of our BBQ place. Wide neck fills easier and opening can be easily cut to accommodate chunky ingredients. Price is great too. Cheap and durable 24 ounce wide mouth squeeze bottle. Dont ever buy a squeeze bottle that is NOT wide mouth. These are so much easier to fill and clean! You may need to cut the nozzle a bit to use it for thicker sauces. Super good price on these squeeze bottles in a 6 pack! We used these for our griddle to spray water on them and it worked great. The wide mouth lets a lot of water some out at once. A normal mouth would not have worked for us, we need the extra amount of water. Thanks for such a great price too! I chose this size because It holds the perfect amount per day, because who wants to throw out extra sauce from too large of a bottle? Plus, if your sauce is too thick, simply cut the spout down to allow for an easier squeeze. Simple, cost effective sauce squeeze bottle for all purposes. We cut the tips on some of them to allow for some of our thicker sauces. These are great all-purpose squeeze bottles. We use them for just about everything: oils, sauces, creams, etc. The tips are a bit narrow for thinker contents, but you can just nip them a bit to expand the hole. Great price and easy to wash and refill. We use them for a variety of syrups, sauces, vinegars and ketchup. Also easy to write on so you know what is in them. These bottles are really durable and hold a lot of product! We use them for all of our condiments, sauces, and dressings. The wide mouth makes them easy to clean. These bottles are perfect for holding and pouring shave ice syrup. Electric wire caps on the top fit nicely and secure. Just screw them on the pour spouts, and you have a nice secure lid! These are fine. Sometimes it is hard to get the cap screwed on straight, and if you give it a good squeeze the cap can come off and mayo can go everywhere. But with some care, they work great. I love these squeeze bottles! 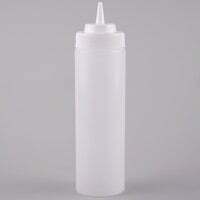 I make different sauces and store them in these bottles for easy access with the wide mouth pourer. I bought many of these and they are terrific! These are a great value. Pros: They run through the dishwasher great They hold a lot They squeeze easily, but bounce right back to their original shape well. The tops screw on/off securely, and don't pop off when squeezed. Nice wide hole in the bottle tops, so you can fill easily. Cons: There are no caps, which leaves them open, if you don't use them all the time. Overall, I like them, though that open top is an issue for home users. Since they come in multiple colors, that could be handy, too, though these are transparent enough to tell if it's ketchup or mustard, etc, without labeling. They are a bit bigger than I needed, but I'm happy, and the price is great! These bottles are used quite a bit in our shop for our wing sauces. Great size to hold plenty of sauce or butter without having to constantly refill. Great price for a quality squeeze bottle. Duable but not heat resistent so beware. I left one too close to a heat lamp and it was ruined.Will purchase in the future. Great squeeze bottles for hot or cold sauces!!! Great value pack/ price!! Wide mouth top makes filling the bottles a breeze, you just have to turn them over and pour your dressing, etc. right in them! Lids stay on snug! Large, simple, and affordable. These is a great pack, with 6 bottles. They look clean and are exactly what you would expect them to be. No complaints! Quality squeeze bottle for the price. The wide mouth makes it easy to fill, refill and to wash. Have ordered this bottle many times with complete satisfaction.